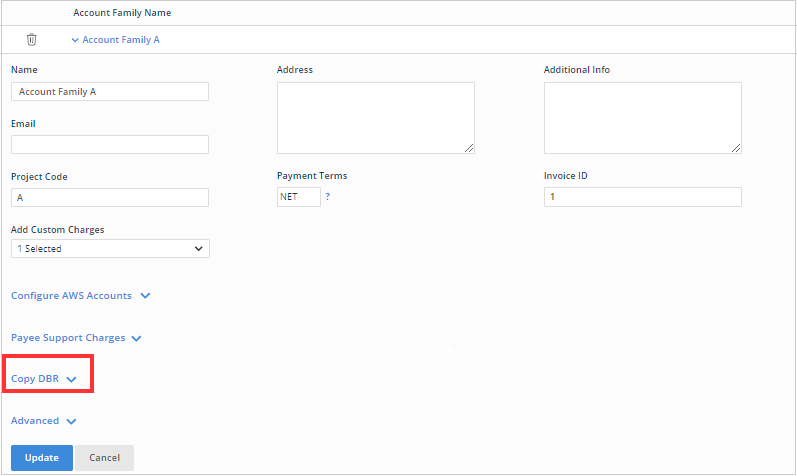 The Copy DBR functionality allows the application deliver a Detailed Billing Report (DBR) for an account family into a user-defined S3 bucket. This functionality provides customers with their raw billing data, which is filtered down to only the costs associated with their account family. Each time Amazon updates the billing data for the master payer account, or the billing data is reprocessed, a new DBR copy will be delivered to the S3 bucket. The DBR copy will retain the same file structure as the DBR written by Amazon. For the application to have the ability to write the DBR copy to an S3 bucket, you must grant the proper permissions. You can use the IAM credentials associated with an account or you can create a new cross-account role within AWS. The Copy DBR page opens. Follow the procedure in the Using the Copy DBR Feature topic.